May 2017 – May I Have Your Attention, Please? The play allows for community resources to be utilized and a dialogue to begin. Many schools have guest Counselors lead a discussion with parents, students and community members after the performance. 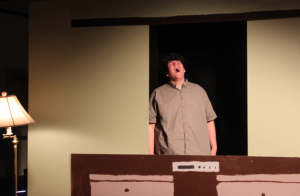 The play does not glorify suicide and leaves the ending open so there is no graphic content or depiction of suicide. The play offers an outstanding role for a leading male actor. 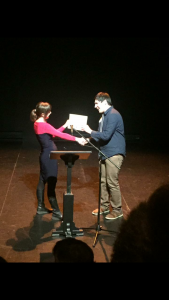 Many actors who have played the role of Chris Borthwick have won best actor at state and Provincial competitions. The play takes place in one location so the set is a simple living room design. The costumes are also simple making this an affordable play for your budget. 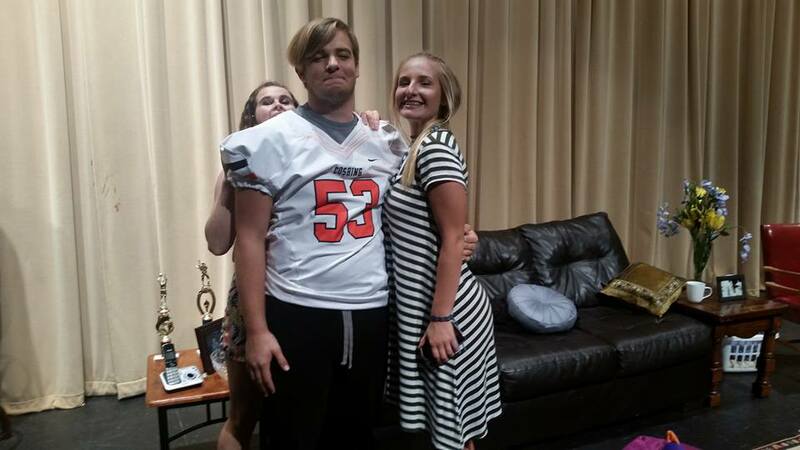 The play runs 30 minutes so it is perfect for one act play competitions. The play offers diverse parts with 3 female and 3 male, 1 m or f role and up to 7 extras. 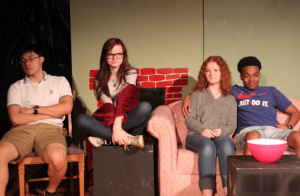 The play is perfect for Student Directed one act nights. It has become a favorite of casts and student directors. Student Directors love the message yet it presents a challenge they also embrace in directing. 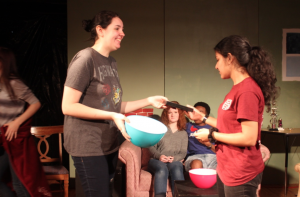 The play has an original theme song which may be performed with the play or used separately for opening track if you have musically inclined students. The playwright is very active in spotlighting your performances of the play and helping you to spread the message. The website offers many interviews, photos and video clips to help you with ideas for your performance. In addition, the playwright would consider it an honor to video chat with your troupe and answer questions about the play or writing process. The play is perfect for Community Theatres and Summer Theatre programs as well. Character ages range from tween to adult. 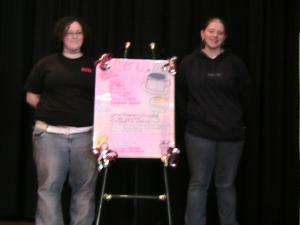 Middle Schools, High Schools and Community Theatre groups have performed this long running play. 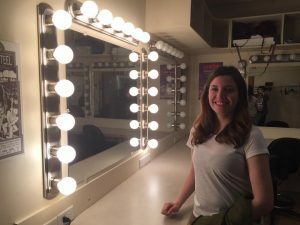 The play offers a list of Directors who are willing to share their experiences with performing the play so this is a great piece for a new Director. It’s been 20 years since the first actor brought Christopher David Borthwick to life. Over the years I have had the pleasure of seeing many casts make the play their own. 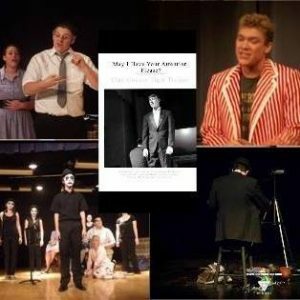 Since May is the month that usually closes out the year for school performances, I wanted to pay a special tribute to The Henry Gordon Academy. This piece will be a longer spotlight than I’d ordinarily post, but this extraordinary group deserves it. Let us start from the beginning. First of all, this group is from Cartwright, Newfoundland and Labrador. 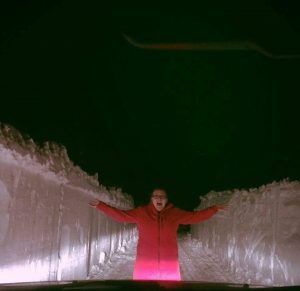 A small coastal community, with about 500 citizens, that was only reachable by boat or airplane up until 10 years ago when the Trans Labrador Highway was built. The school, Henry Gordon Academy, has approximately 74 students and 9 teachers. 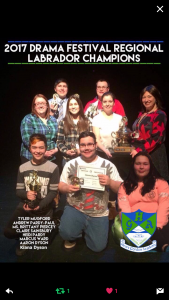 The school participates in the annual senior high drama festival each Spring with a cast of 7 plus a teacher sponsor/director. 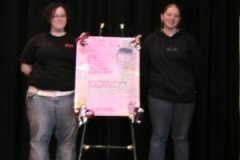 This year, the special education teacher, Brittany Piercey, decided to take on the drama group. She held auditions in January and from there, the cast was selected. Something you need to know is that Cartwright is known for their comedies. Each year the audience expects Cartwright to make them laugh. However, this year Miss Piercey decided to push the students to try something different. 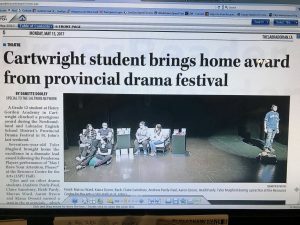 Using the website for Publisher, Pioneer Drama, http://www.pioneerdrama.com, the cast narrowed down their options to 2 plays. But, the sample from “May I Have Attention, Please?” won them over and so the journey began. Snowstorms, like REALLY BIG snowstorms, can’t stop this Troupe from their mission! “Right from the start his intention was to spread the word… get the message out there… let people know that he is informed and there to help. This role in my opinion changed Tyler and coming from a little isolated town of 500 people he had something to prove and knew he could do it. His dad didn’t think he would be able to watch Tyler pull a gun to his head. It was, to say the least, a very emotional moment but he too, soon understood what Tyler was telling us. Tyler is a very passionate, giving, loving young man. He often thinks outside the box and when he is committed to or about something there’s no stopping him and really that’s why this part fit him to a T.. He tends to break things down and really thinks about what he is doing or what he has to do..We are so very proud of our son. He makes us proud everyday! To say we we’re over the moon when the group performed for the first time would be an understatement! The audience in Goose Bay responding like they did and to know people were moved to tears and his message was so huge it impacted them and he connected to so many… really there are no words. I remember his dad saying to me he did what he wanted to do! To win and have the opportunity to perform provincially in St. John’s NL at the prestigious LSPU Hall to share his message was a bonus. But to have the same happen there people responded in tears with a standing O and comments that he will forever carry with him! As a parents of this wonderful 18 year old young man we are so excited for what’s in store for him. 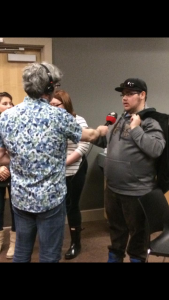 He’s off to university in the fall and wants to be a English teacher and was told at the St. John’s festival not to give up acting that he is a natural with a bright future.. The sky is the limit for him and we will be with he every step of the way.” As for Tyler’s journey with the role, he had this to say, “Upon taking the role of Chris, I didn’t realize the impact I could have upon an audience with portraying him. I remember after we performed at Goose Bay for the Labrador Regionals and looking out at the audience and seeing people crying and wiping their tears with huge smiles across their faces, realizing they too had experienced the emotional roller coaster the Borthwick Family had gone through, to know it was my doing. I quickly realized just how much Chris can impact people. First Time Winner of Regionals! Now how do we raise $20,000? And they were off to St. Johns! They performed the first night of the three day festival as the final play of the evening but not before doing a radio interview with CBC. 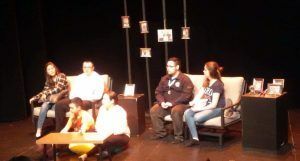 Another amazing feature of their performance was the announcement that parent, Sandy Mugford could Facebook Live the performance so all in the community could tune in as well as the playwright who lives in the US. The live video has been watched over 2000 times and there were as many as 115 viewers at one time watching live from all over the world. The world was watching as the final line was said and the theatre erupted into thunderous applause and a standing ovation. It was the only standing ovation of the night. There was no shortage of tears as the audience hugged each other and awaited greeting the cast. So what? A Group of kids took a trip by plane. Big Deal! Why spend so much money on the Arts and a program of 7 students? What could they have gained that was worth $20,000? Couldn’t the money have been spent to help more students? While these questions often are encountered by Arts’ Departments worldwide, one must look at how many the money really impacted. We have the 7 students, 1 teacher and 2 parents who attended. Add to that all those who watched the home performance. Add to that all the students who watched the performance at Regionals and Provincials plus the Judges and all who watched Facebook Live and all those who saw it and will tell someone else about it. Beginning to see the benefit of funding the ARTS? This experience has helped the cast realize their potential on stage. It has opened up doors to more serious theatre work and to perform more plays that handle serious topics. It has also inspired so many other students. Wanda Lee Mesher, another parent member whose son Marcus played Charlie and is the youngest member (Age 13) of the Ponderosa Players adds that Marcus has never looked back after being hesitant at first. 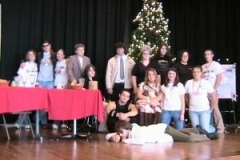 ” This was Marcus’ first year in Drama. When he saw the auditions posted at school, he ran up to his older sister in the hall and said “Sis, should I do Drama? ?” And she asked him if he wanted to and he said yes, so she said “OK, well do it! Like many of the actors, the characters took some time to be brought to life. Marcus did find it hard at times, with his character, because he was supposed to laugh at Chris in the video and think he was funny. He knew there was nothing funny about it, and Miss had to remind him a few times that he was playing a character and that it was ok. I’m really proud of my boy and I’ve seen him grow and mature so much through this experience. I know this is just the beginning for him and I know he’ll be auditioning again next year!” and Marcus isn’t the only one who is showing a continued interest. 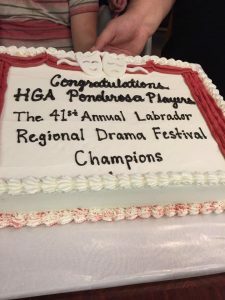 Since returning from provincials, the younger students have been approaching Miss Piercey, expressing their excitement to join drama and even saying that they want to be actors/actresses when they grow up. This have been an amazing opportunity to inspire the youth in Cartwright to really give their all when it comes to their passions because they are achievable! 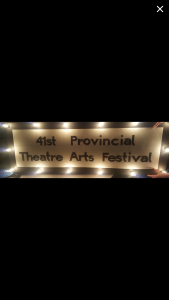 While at Provincials, the students were able to participate in numerous workshops, such as song writing, pacing, stage combat, and more! 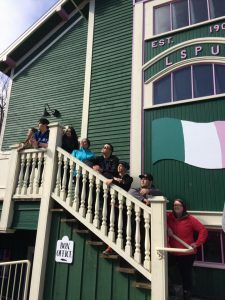 They were able to meet other youth all across the province of Newfoundland and Labrador and make new friends that will last a lifetime! 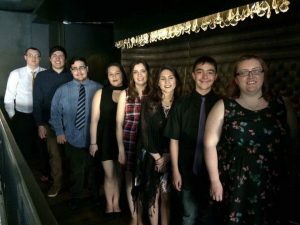 They were also able to meet published playwrights, popular musicians in the St. John’s area, and see the province’s capital city as an artistic outlet. 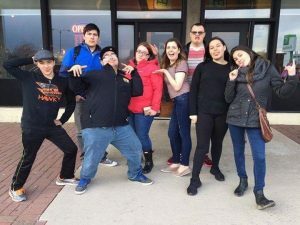 They got to participate in fun activities like lasertag, escape rooms, and a fun place called Axtion, where you can climb rock walls, and they even got to try new foods and restaurants that they normally wouldn’t be able to, like the Keg. Overall, this experience has brought us closer together as a group. While we are sad that it is over, it really is just the beginning as these kids get to pass on the torch to the younger students. 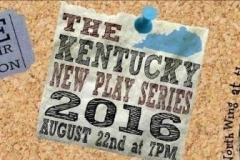 In addition, a huge thank-you goes out to Catherine Rhoden-Goguen for writing this play. We appreciate all of the support we received from her on this journey. We hope we have done justice to your play and the characters. So this is where the fairytale ends and since they spread their message well, all LIVE happily ever after! 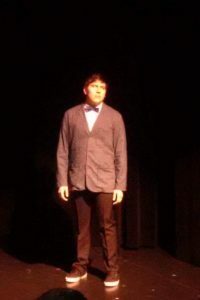 Collin Walters of Midland Valley High received the Best Actor award for his performance in “May I Have Your Attention, Please?,” by Catherine Rhoden-Goguen. Stephanie Trotter is Midland Valley High’s faculty representative. As part of the 15th annual Garcia Theatre Project, students from North Augusta, Midland Valley, Ridge Spring-Monetta and South Aiken high schools participated in workshops, including an improvisational class taught by USCA theater students, in the morning. In the afternoon, actors and technicians from each school presented a one-act play. After their performances, students received awards. Karol Stewart of South Aiken High was named Best Student Director, and Kiara Gamble of Midland Valley High received an Honorable Mention as Student Director. All-Star Cast members were as follows: Latashia Lockett, Ridge Spring-Monetta High; Caroline Pethick, South Aiken High; Reggie Vinson, Midland Valley High; Jaxen Coleman, Midland Valley High; Courtney Van-Eck, Ridge Spring-Monetta High; Maurice Milton, North Augusta High; Zach Phillips, South Aiken High; and Joel Napier, North Augusta High. 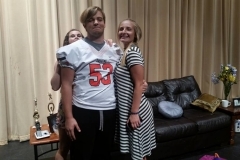 The project started 15 years ago as a partnership between the theater program at USCA and the Public Education Partners, which supports public schools, to promote theater in the Aiken County Public Schools. A few years later, Carlos and Karen Garcia agreed to sponsor the event. 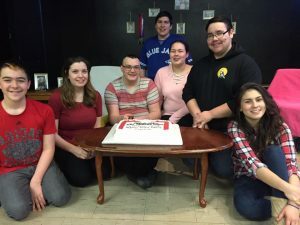 “We wanted an opportunity for theater to be performed in the high schools, so we started this one-act play festival,” Benjamin said. Ariel William will see the fruition of her work take the stage May 3, 2017 as Mississippi School of Math and Science in Columbus, MS brings May I Have Your Attention, Please? to the stage. William has the distinction of being the first student director for May I Have Your Attention, Please? in her state.